It’s fairly easy for most of us to have the ability to tell the difference between a man’s toiletries and a woman’s in the bathroom. Chances are, the guy has a bottle of shampoo, shaving cream, soap, a razor, toothbrush and toothpaste, and maybe some mouthwash. Other than that, we like to keep things pretty simple, right? As long as it gets me clean, I’m happy. Most guys don’t realize that after they shampoo their hair, they need to use conditioner as well. Now, most you might not think that conditioner sounds particularly manly, but not using it might make you look unkempt, or maybe unhealthy. Typically, guys wash their hair once a day or every other day. After washing your hair, you need to condition. If you have been by the barber shop for a haircut, we offer to wash and condition your hair. Depending on your hair and scalp conditions, we use various types of shampoos and conditioners. When you get your haircut, one of the ways that we restore shine, moisturize your hair and scalp, and even reduce static electricity (no one wants their hair sticking up) is with conditioner. Adding conditioner to your bathing routine is a great way to take care of your hair and scalp. New hair products, like the ones from the Paul Mitchell Tea Tree line, offer a conditioners that not only restore your hair, but also add additional hold. If you have questions about achieving healthy hair without having to buy a cart load of hair products, contact us at Dave’s Barber in Woodstock, GA for a few more tips and tricks. 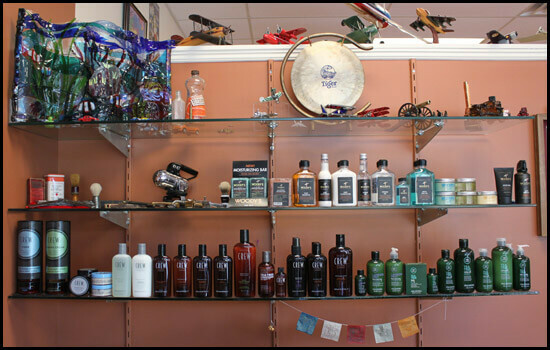 We can also share with you what we use in house and sell for the guys who get haircuts at our barber shop.